Last update of the month but first of the week! WestJet turns 20 years old today, or are they really only 5 years old since they celebrate on the leap day every four years? Either way congratulations to WestJet! To celebrate their 20th they have two offers, a seat sale and a WestJet Rewards bonus. Check out both below! 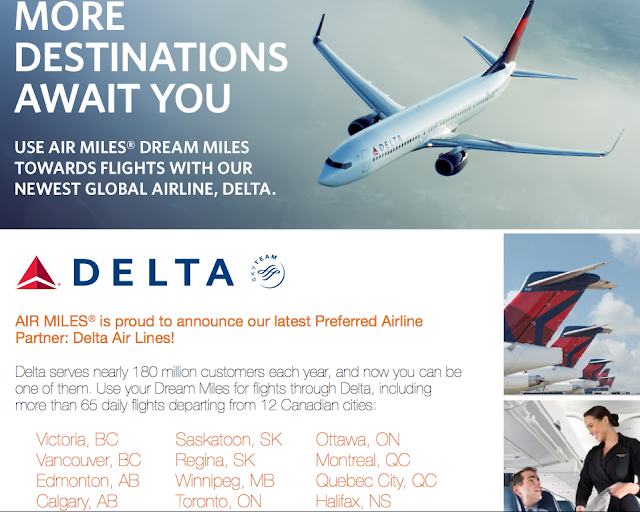 While being added to AIR MILES a few years ago as an airline where you could redeem 'more' miles for flights, Delta Airlines has now become a full fledged partner airline of AIR MILES. What does this mean? This means Delta flights will now be priced at the award chart prices (low and high season) that many of you are used to for Air Canada, WestJet, American Airlines etc. I'm not exactly sure when this commenced so it could be old news but I just noticed it when I logged into the travel rewards section of the AIR MILES website. We were going to have a separate post today for the latest Air France KLM Flying Blue promo awards as Edmonton is included again, however the new offers were only up for a few hours only to be pulled by AF KLM. Maybe they are adding more offers or waiting until it is actually March 1st to release them. Stay tuned for an update tomorrow. WestJet has released a great seat sale to celebrate their 20th Anniversary! Book by May for travel Apr 1 - Jun 28. Find out more here. Starwood Hotels has a leap day sale for stays at their Canadian locations. 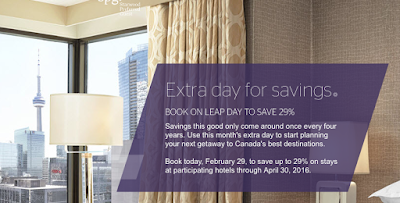 Book today only to save up to 29% at participating hotels until Apr 30. Find out more here.